The wave of attacks on foreign-owned shops in some (South African) townships raises uncomfortable questions about xenophobia in South Africa. These unfortunate episodes raised certain questions that one must ask: To what extent can South Africa's inconsistent immigration policy be blamed for xenophobia? Do foreigners really 'steal' South African jobs? Do foreign-owned small businesses have an unfair advantage over those owned by South Africans? Are other African nationals residing in South Africa being targeted for reasons that have nothing to do with the economic disparities presently prevailing in the country? Are the present killings of fellow Africans, Nigerians in particular, an attempt by unknown forces to create tension between the citizens of Nigeria and South Africa, thereby undermining their social-economic and political cooperation on the continent? Nigeria's commitment to Africa's liberation was pursued most actively after Murtala Muhammad successfully backed the Movements Popular de Libertação de Angola's ascent to power in Angola in 1975, by providing the swing vote in the OAU decision to recognize the MPLA. Nigeria had played a role in the independence of Zimbabwe and in the late 1980s, was active in assisting Namibia to achieve Namibian independence. In the latter years, Nigeria contributed about US$20 million to assist the South West Africa People's Organization in the 1989 elections and other preparations for Namibian independence. (Abegunrin). Nigeria also contributed financially to liberation movements in South Africa and to the front line states of Zambia, Tanzania, Mozambique, and Zimbabwe, which were constantly harassed by South Africa. Although Nigeria's armed forces were among the largest in black Africa in the early 1990s, sizable military might has rarely been used in foreign policy (see Local and Bilateral Issues; African and Regional Issues, ch. 5). The army participated in peacekeeping forces, either alone or through the OAU and contributed personnel to United Nations peacekeeping missions. In line with its ECOWAS commitment, Nigeria was one of the main contributors of troops to the ECOWAS Cease-fire Monitoring Group (ECOMOG) sent to Liberia August 23, 1990 after the peace talks there failed. Additional forces were sent in late September 1990 under a Nigerian field commander, General Doganyaro (Kluwer Law International). In July 1974, the Gowon government decided to sell crude oil at concessionary rates to African countries on condition that they had their own refineries and would not re-export to third countries. The decision came despite Nigeria's role as an Organization of the Petroleum Exporting Countries (OPEC) member generally in favor of higher prices and after more than two years of deliberations. Nigeria acted largely in response to external pressures. International actors attempted to divide Third World countries into OPEC members and non-oil producers; various African countries, especially Liberia, begged for less expensive oil; and both the Organization of the Islamic Conference and the Organization of Arab Petroleum Exporting Countries had established programs to aid poor countries while encouraging other oil producers, especially African nations, to follow suit. Providing subsidies for African countries was a safe move for Nigeria because Africa comprised only a small portion of the country's total oil export market, it enhanced Nigeria's position and influence in Africa while building African solidarity, and it protected security interests by preventing economic decline. (Helen Chapin Metz). Moreover, this example of generosity aided Nigeria in its efforts to create ECOWAS. In November 1990, Babangida suggested that Nigeria might again offer concessionary prices to other African countries as the Middle East crises pushed oil prices upward." It is shameful and disgraceful for any African Nation to discriminate against other Africans, irrespective of their nationality, considering the unfortunate history of the African continent. All over the world, from China, to the Americas, Europe, Africans are discriminated daily, due to their skin color. The attacks against other Africans, especially Nigerian own businesses in South Africa, have been going on now for sometimes and it is about time these acts of violence come to an end. The Government of South Africa, without doubt, has the capacity and the resolve to identify and root out those responsible for fostering xenophobic activities in the country. These violent attacks have the propensity to undermine the goals and objectives of the African Union. Perhaps, there is a need for the African Union (AU) to draft or revisit its polices, especially those relevant to the promotion of basic human rights and the safety of other Africans who reside in other African countries. Xenophobia unfortunately, is becoming a prominent aspect of life in Africa. From Kenya to the Maghreb and across Southern Africa, discrimination against non-nationals, particularly fellow Africans, has been on the rise according to international media reports (Crush, 2008). 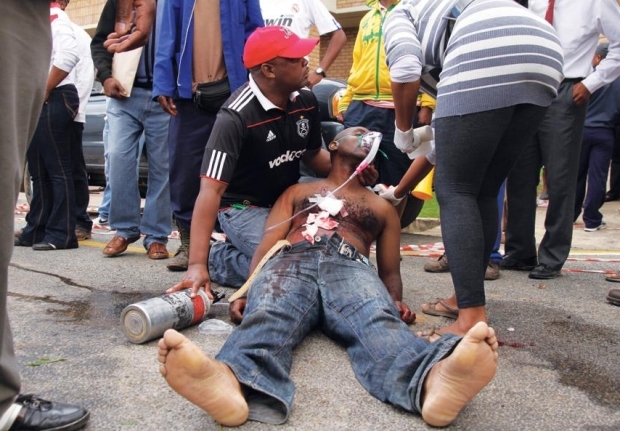 The South African Government, it is hoped, will endeavor to stop and put to an end the various "xenophobic attacks” and violence against fellow Africans residing in South Africa…. Let us, as Africans, reflect on the words of the African Union Anthem. Let the words be reflected in our thinking and in our actions.